This is a meal full of vegetables and is very tasty too! 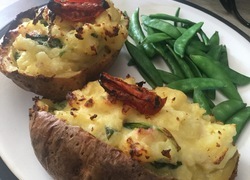 I have added bacon to the zucchini as I find all vegetables a bit bland, and the shallot in the spinach patties gives them added taste, as well as chili flakes. The spinach patties would also be a great vegetarian option for making burgers, topped with a fried egg. Cut the zucchini in half lengthways but leave the ends on. Scoop out most of the flesh with a spoon, but leave a small edge of zucchini around the sides so that you can fill it and it stays rigid. Cut the flesh up into small pieces, and add the sour cream. Cook the shallots for a minute or so, and then add the chopped bacon. Add the curry powder and salt. Cook till the onions are cooked and the bacon is brown. Add the thyme -this can be 1 tsp of fresh thyme leaves, but I used the dried one. Cut the seeds and liquid out of the tomato and chop finely. Add the bacon and onion mix to all the other ingredients, and mix. Grate some Parmesan and add to the mix. Put the zucchinis on a baking dish lined with baking paper. Push the mixture into the zucchinis, pressing down quite firmly. Add more of the freshly grated Parmesan on the top, plus some grated black pepper. Meanwhile make the spinach patties. Thoroughly squeeze out all the liquid from the chopped spinach. I made them earlier and then put the mixture in the fridge for a while. Shape into large patties and, in the same frypan as you cooked the bacon and onion in, cook these - there should be enough oil left over in the pan. Cook them about 5 minutes each side or until they are brown and firm. Take the cooked zucchinis out of the oven. Add the spinach patties, and serve. Do you like being the centre of attention? 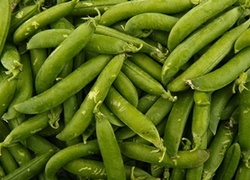 Do you ever buy fresh green peas?